Sitting in my living room on a snowy Saturday night, I have a hard time believing how warm and sunny it was just a few hours earlier, as I set off to ski The Widow’s Clearing Trail. Since the posting on the history of the Widow’s Clearing from one of last summer’s runs elicited a lot of interest, I thought it would be fun to return to this site on skis once winter hit. Well winter has definitely hit! The snow cover is outstanding for cross country skiers, with almost all hazards other than the larger streams completely buried. 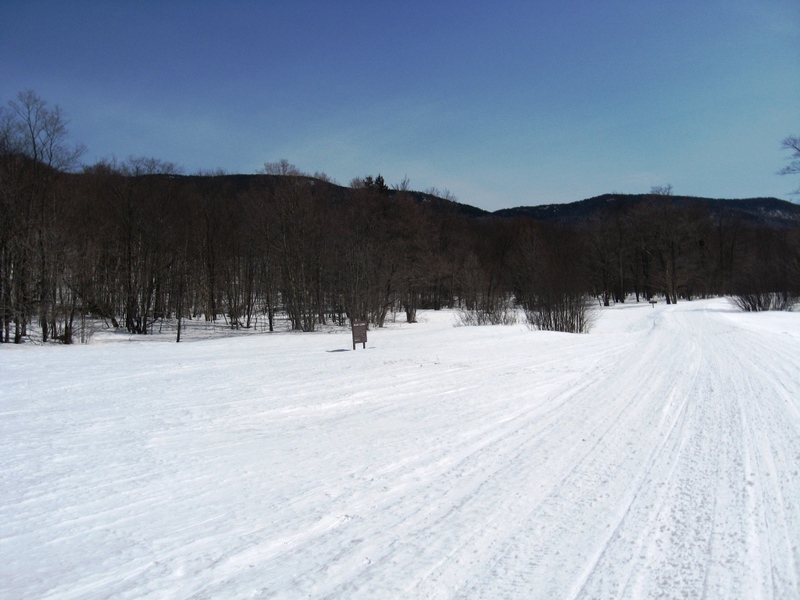 This ski began, as did many of last summer’s runs, at the Brooks Road (aka Chatfield) parking lot off of Rt 125 just past Breadloaf. Usually, this lot if pretty empty, but on this gorgeous morning, there were numerous cars from which other outdoor enthusiasts had already departed. 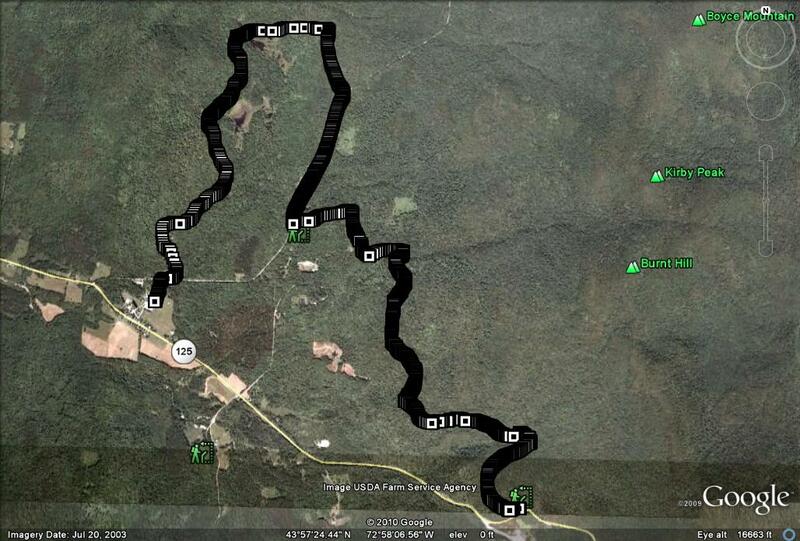 The goal for the day was to cross over the to Widow’s Clearing parking lot on the Ripton-Goshen Road. After about a half mile of easy climbing, I reached the clearing, which was not unexpectedly enveloped in a sheet of white, with only a few brushy trees poking through the uniformly smooth cover of the freshly fallen snow. 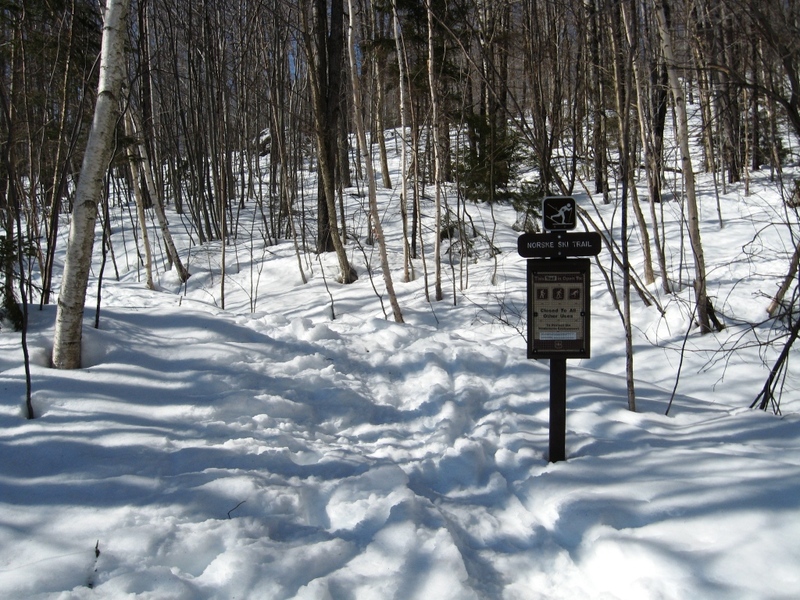 The skier-packed trail continued through the forest, passing several minor trail crossings, but staying on the Widows Clearing Trail, which also coincided with the Vermont’s end-to-end ski trail, the Catamount Trail, with its characteristic blue blazes, for much of its path. 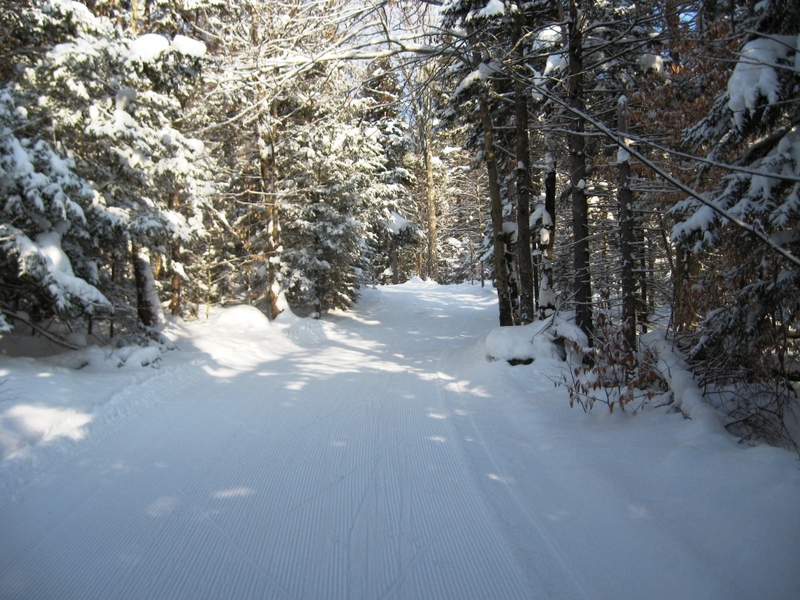 Deeper into the woods, I came across a pleasant surprise – the groomer from the Blueberry Hill nordic ski area had set tracks beyond the normal confines of their more heavily used trail system offering the unexpected pleasures of smooth kick-and-glide skiing. 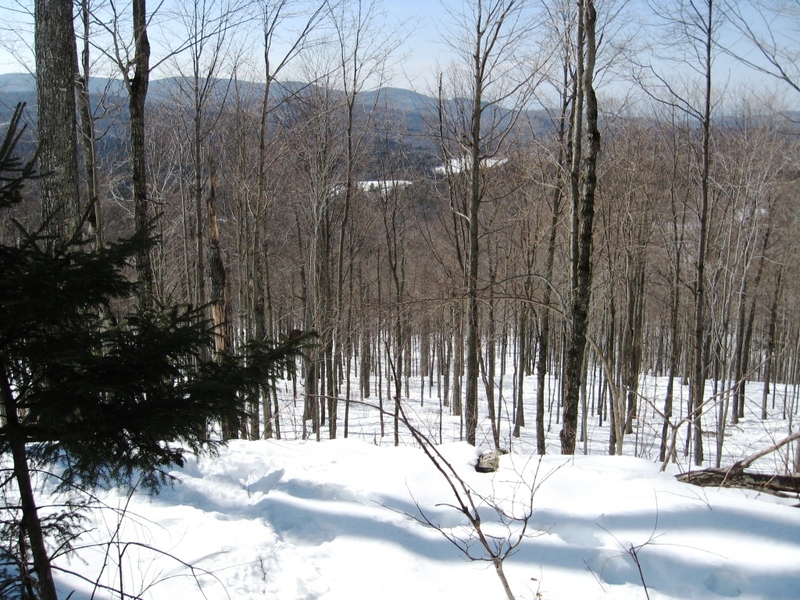 Eventually the Widows Clearing Trail and the Catamount Trail parted ways, and I bore right down the short descent to the end of the trail at the Widow’s Clearing parking lot on the Goshen-Ripton Road. 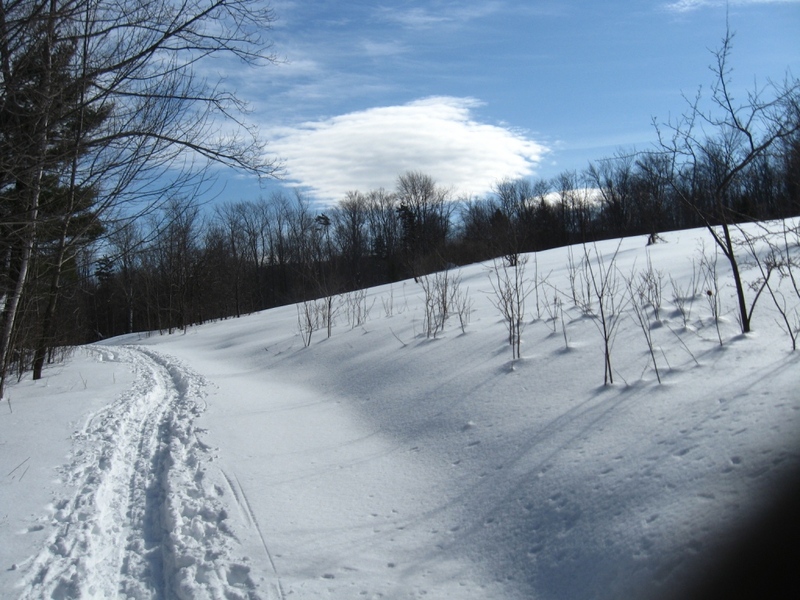 I had originally planned on doubling back on the same route, but when I rejoined the Catamount Trail, the day was too nice to end prematurely, so I headed right, taking further advantage of the groomed terrain. A second short descent to the Goshen-Ripton Road provided a brief roller-coaster descent staying in the deep set tracks. The return trip passed too quickly, but was made even better by a chance meetings with a few friends and acquaintances along the trail, and several energetic but well-behaved golden retrievers. 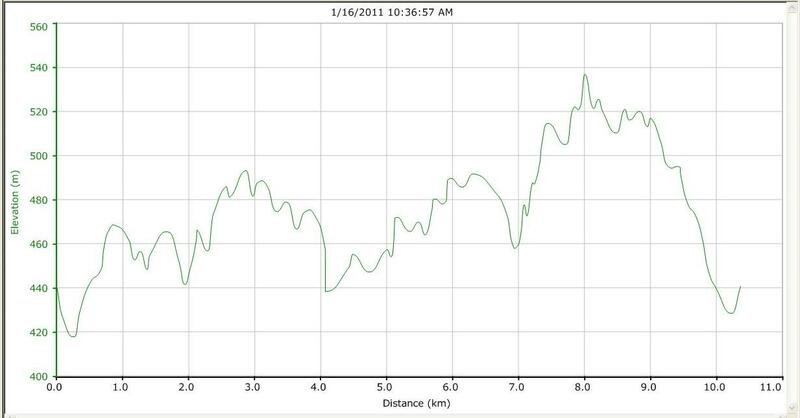 This route covered a little less than seven miles….I mean 11 km…..with almost all the climb in the first half mile. If this snow keeps up, I hope to blog skiing, rather than running into April this year! While the snow cover is much improved from my last posting, the gorgeous spring-like weather could bring the ski season to an early close, so I had to get out over the weekend and enjoy the deep, but increasingly slushy snow. You will also notice something very different about this post. 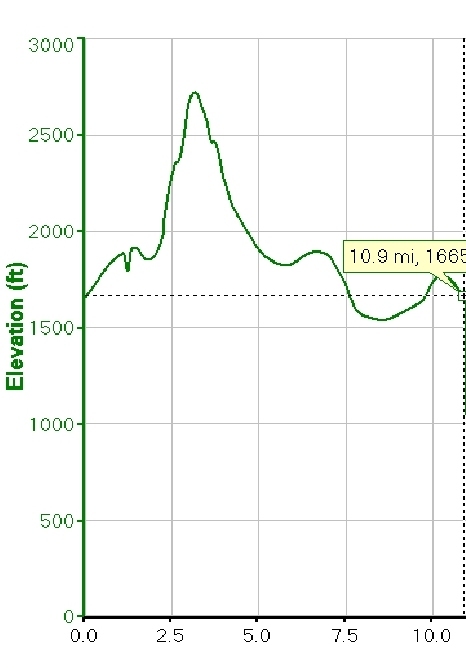 As a rule of thumb, I am usually a purist in that I earn my descents by putting out the effort to gain altitude first. But today, I felt that a lobster analogy was quite appropriate. Most of the time, the effort of cracking open the lobster, and prying the meat out of its exoskeleton is just the cost of enjoying its sweet flavor. But every now and then, as a treat, you just have to say “to heck with it” and order the Lobster Newburg. Today was my Newburg day. How so? I cheated and took the bus uphill, making it a tour with far more descent than ascent. 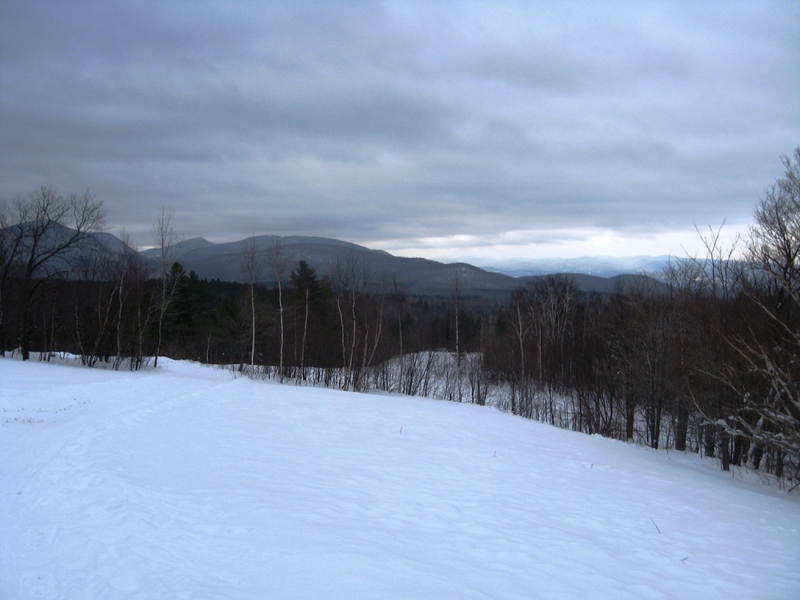 My primary destination today was The Norske Trail, a short wilderness run which begins just above the entrance to the Middlebury College Snowbowl on Rt. 125, and concludes at the Rikert Ski touring area. 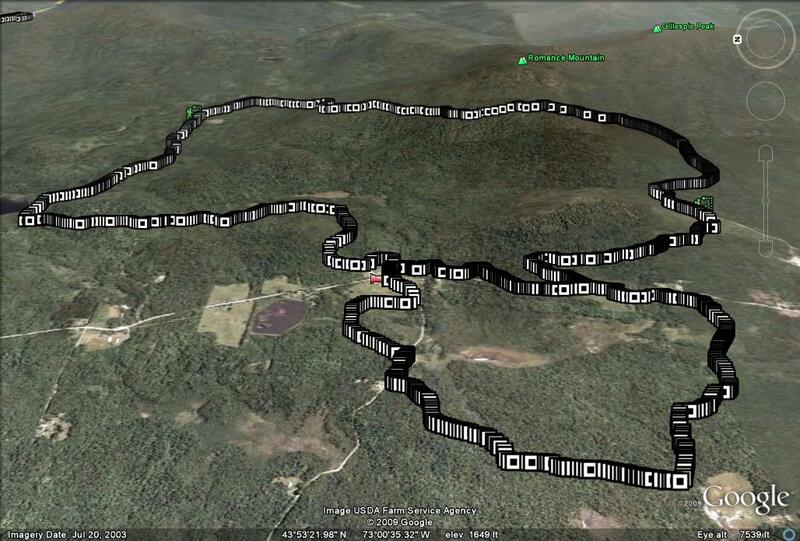 Instead of doing this route as an “up and back”, I made use of the ACTR bus which picks up passengers at Breadloaf and concludes at the Snowbowl. The trailhead for the Norske Trail is a 5 minute walk uphill on Rt. 125 from the turnoff to the Snowbowl. The Norske Trail is much more of a wilderness trail than those in the ski touring areas, or snowmobile trails of earlier posts. It starts off with a series of modest climbs and descents, and despite the lack of grooming, is never particularly challenging. While the trail never seems to get heavy use, you can pretty much count on the trail being broken within a day or two after every good dumping of snow. Cruising along through the open hardwood forest, I eventually came to an overlook, with good views across the valley to Moosalamoo, and the meadows of the Breadloaf campus. I could see from the well-beaten snow where previous ski and snowshoe parties had also enjoyed the vistas since the last storm. Continuing the gradual descent, one eventually gets to a section where there are several intersecting trails, including the Burnt Hill trail, an easy summer hiking trail which reaches the top of the Green Mt. Ridge. 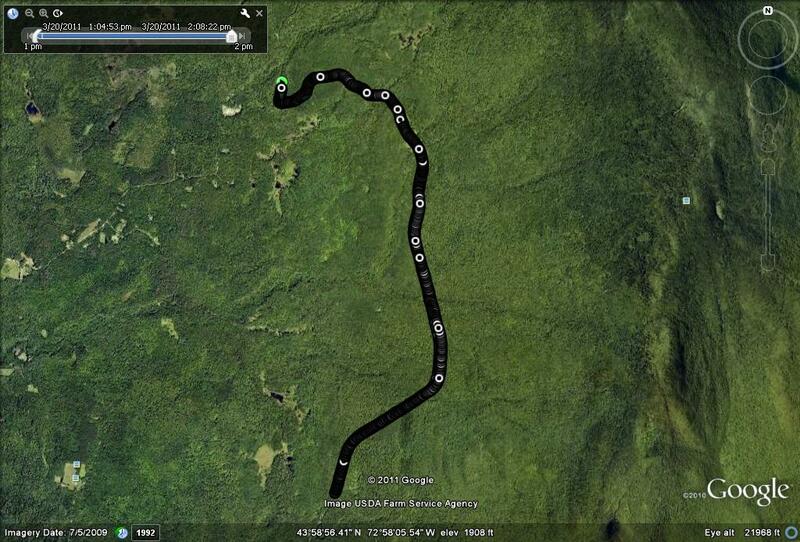 I chose to follow the ski trail marked with blue diamonds until it intersected with Forest Service 59. 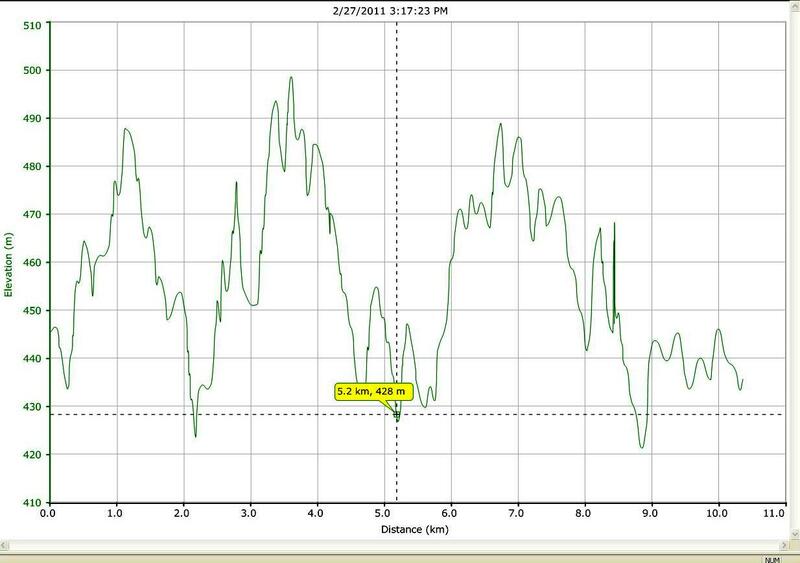 At this point, I had been descending at a leisurely pace, covering a little over 4 km in about 45 min. I knew that a right turn on FS 59, and a left turn onto the Gilman Trail would bring me to the Rikert Center in about 10 min, and I wasn’t ready to call it a day, so I instead stayed on FS 59 for another km or so until I got to the groomed descent on the Brown Gate Trail, extending my afternoon’s ski a little deeper into the touring center. 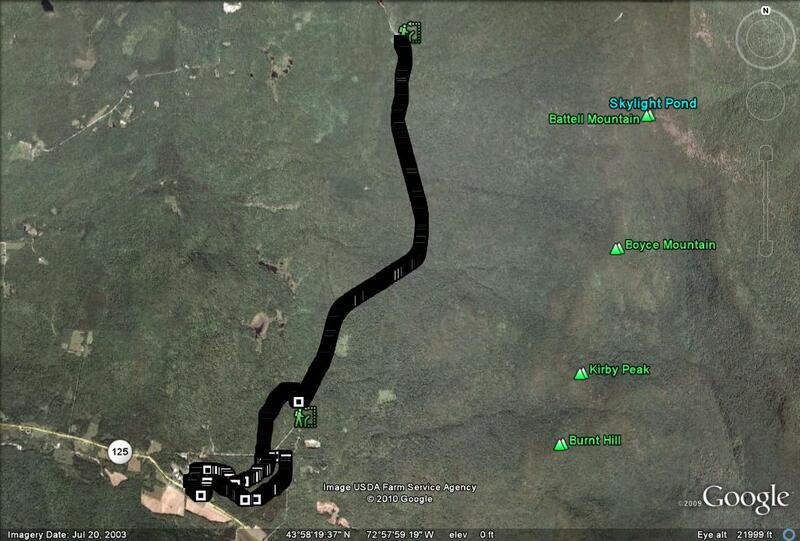 The remainder of this route is made up of the same trails described in the opposite direction at the beginning of my post entitled “Robert Frost Cabin“. 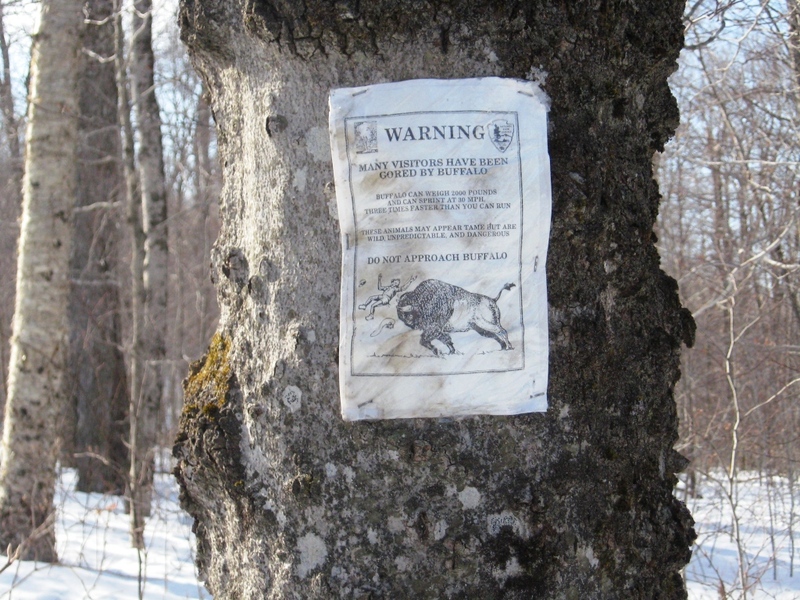 Immediately after crossing the bridge over the beaver pond outlet, I spied a notice affixed to a nearby tree. Curious as to its message, I stopped for a moment to read it. Needless to say, I am relieved to note that some of my fellow backwoods sojourners are concerned for my safe passage in the presence of fierce wildlife. Watch out for Angry Buffalo! 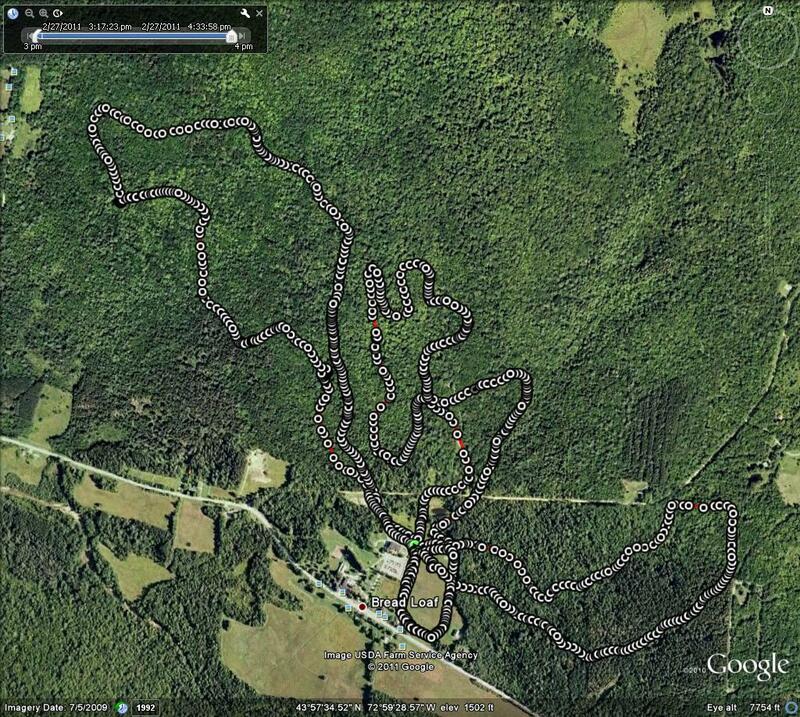 An easy cruise on Rikert Center trails brought me back to my car at the touring center. This was a relatively short tour, covering a little over 9 km, with an overall descent of about 600 ft, but with enough ups and downs, and less manicured trail to keep it scenic and challenging. As a postscript, when I arrived at Rikert to catch the bus up to the start of the day’s ski, I was a little surprised to see an older gentleman skiing in a tux and stovepipe hat, as well as a much younger woman cruising on by attired in a jogbra and blue jeans. Unbeknownst to me, Sunday was the day for the rescheduled Breadloaf Citizen’s Race, a “Just for the Fun of It” race which I have participated in on many occasions in years past. While I was sad to have missed the race, I was glad to see the race go on in the same spirit of semi-competetive fun which has been its hallmark for decades. With the dearth of fresh snow and thinning cover, I usually head for higher altitude terrain. While pleasantly surprised by the conditions at the Rikert Ski Touring area last weekend, I had a hunch that the cover would be even better on Forest Service 59, which has the advantage of being just a little higher up the mountainside. 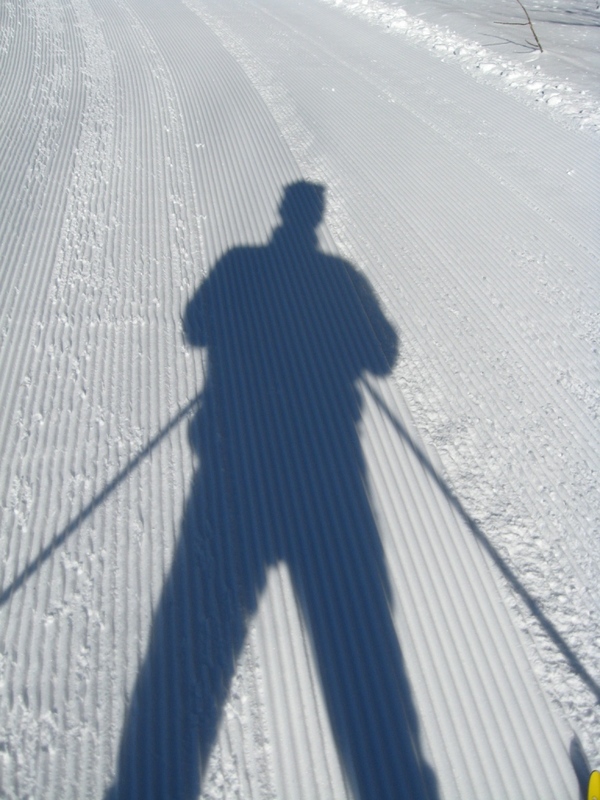 Skate skis are usually the best call in these conditions – it is hard to set the good deep tracks for optimal classic skiing when the cover is light. 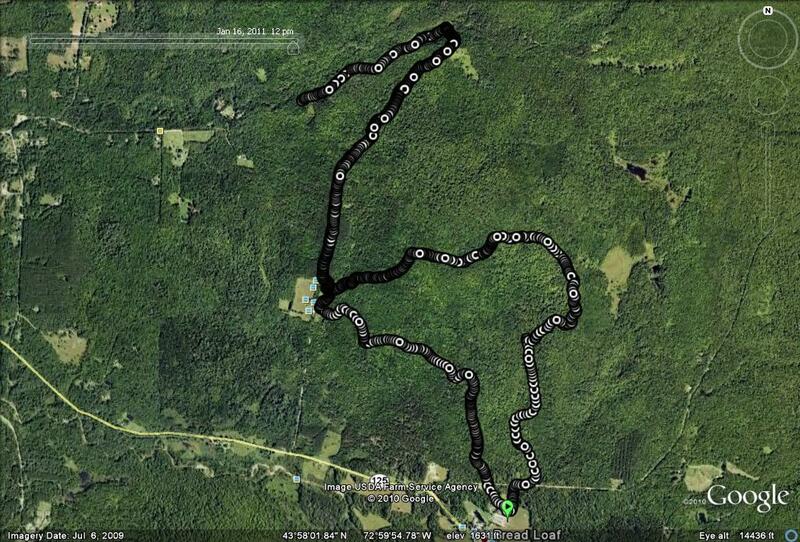 Forest Service 59 is the dirt road which passes behind the Breadloaf Campus before climbing into the mountains and eventually looping into backroads Ripton. 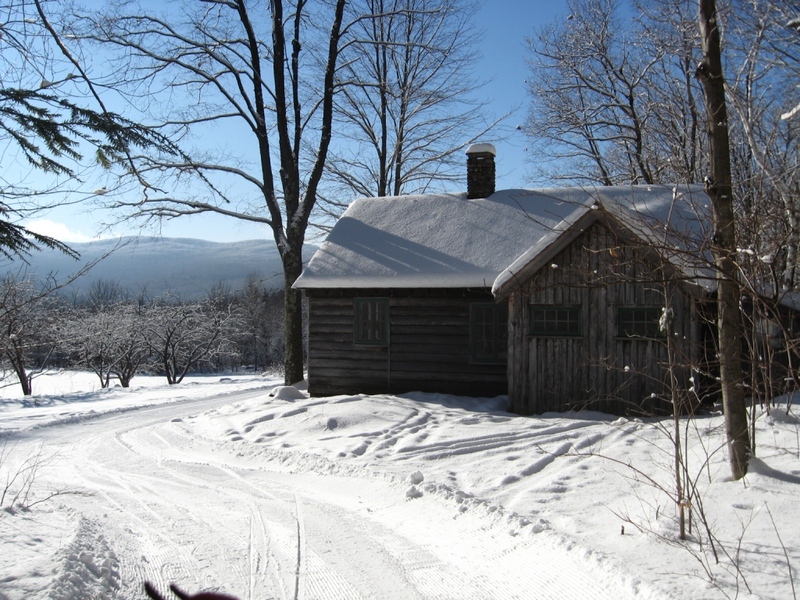 While the road is fully accessible to 2WD vehicles in the summer, it is plowed for only the first mile or so, and never sanded during the winter. Nonetheless, the lower segment makes for poor skiing due to the modest vehicular traffic it receives. 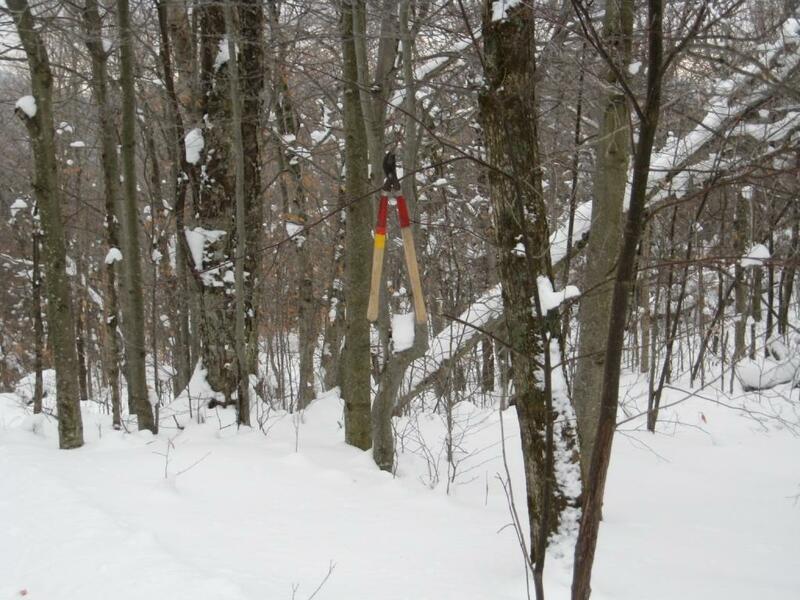 One can reach the well-covered upper reaches through the Rikert trail system, however. 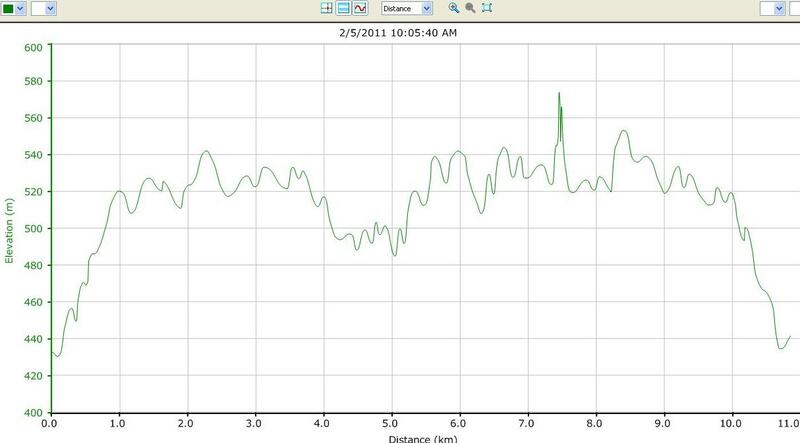 On this day, I warmed up with an easy partial loop on the Batell Trail. After the short descent on this well-travelled trail, take a hard right up the short climb onto Fletcher, and another right turn shortly thereafter onto Gilman. 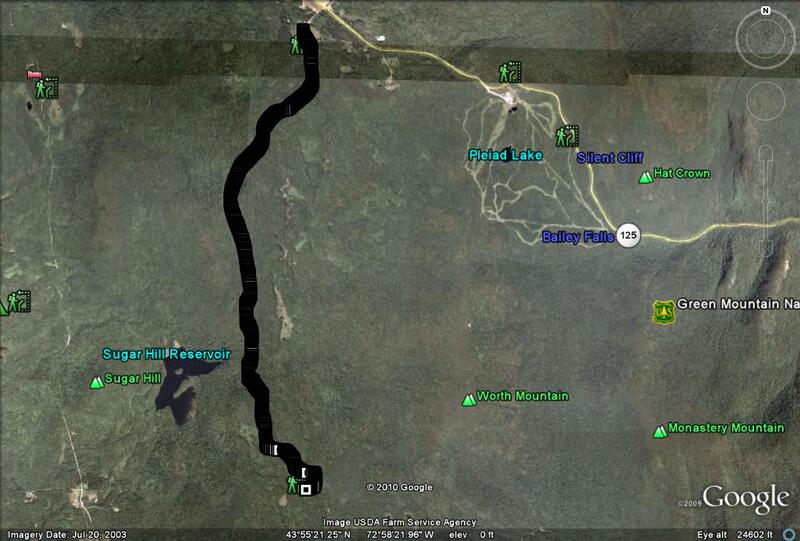 After crossing FS 59 at this point, follow Gilman for a kilometer or so, until it rejoins FS 59 higher up. Here, take a left turn onto 59, but if the cover is thin, don’t worry about it, as this only lasts for a hundred yards or so. You will immediately reach a sign indicating the end of winter maintenance for motorized vehicles (other than snowmobiles), and this is where the skating gets great. This road is maintained for snowmobile travel for many miles, and I have found that the groomer which they use for these machines makes for a near perfect ski skating surface. Thanks once again to VAST and the snowmobilers who support it! 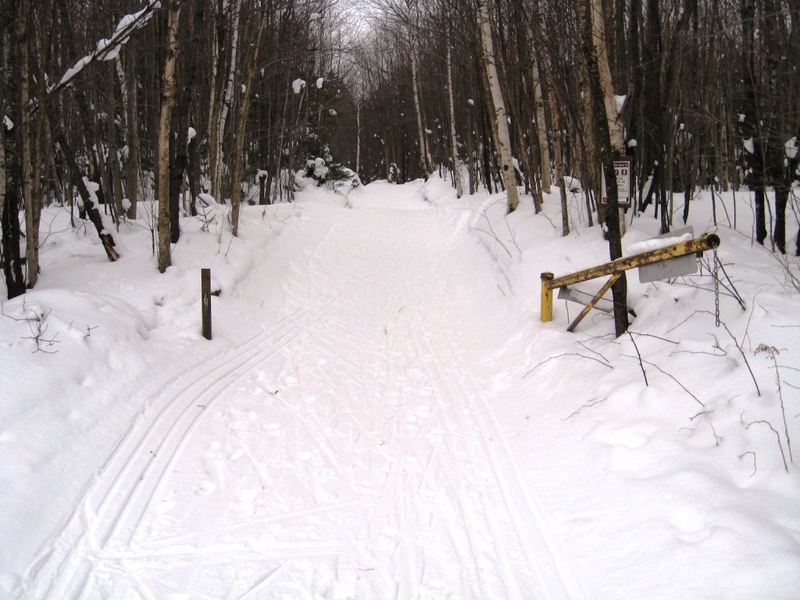 You can also ski here on classic skis, or course, but the wide road, lack of tracks, and frankly, lack of snowmobiles, makes a long easy skate most appealing. At this point, you can pretty much go as far as you want. The road climbs gradually, but relentlessly for about 10-15 min until you reach the height of land. From this point on, the skiing is very easy, with a few short descents and climbs, and is a great place to really stretch out your stride and go for great gliding. I found this trail very reminiscent of much of the course for the Gatineau 55, a ski marathon on the Worldloppet tour which I sort of competed in many years ago. 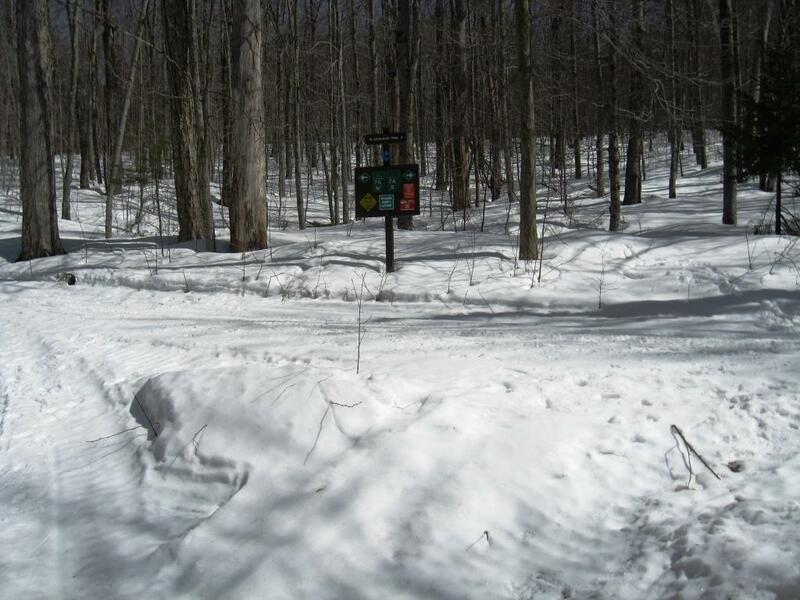 No time for a marathon today, so for my much shorter ski I arbitrarily chose to turn around after a few miles at the Sawmill Clearing, which also serves as the trailhead for the easy climb up to Breadloaf Mountain. Perhaps I will carry my snowshoes on my back another day to add this climb to the short ski tour. While you know you are going uphill most of the way out, you don’t realize how much you have climbed until your return – I was amazed to see that my return took barely half the time of my trip out. Cruising back to the touring center by pretty much the same route made this a 13 km (8 mile) trip – just right for a busy Saturday when I had other family needs to attend to. As promised, I am posting occasional ski tours over the winter. I have been an avid cross-country skier even longer than a runner – in fact I started running in the first place to stay in shape for skiing, feeding my delusions that I was a nordic racer. 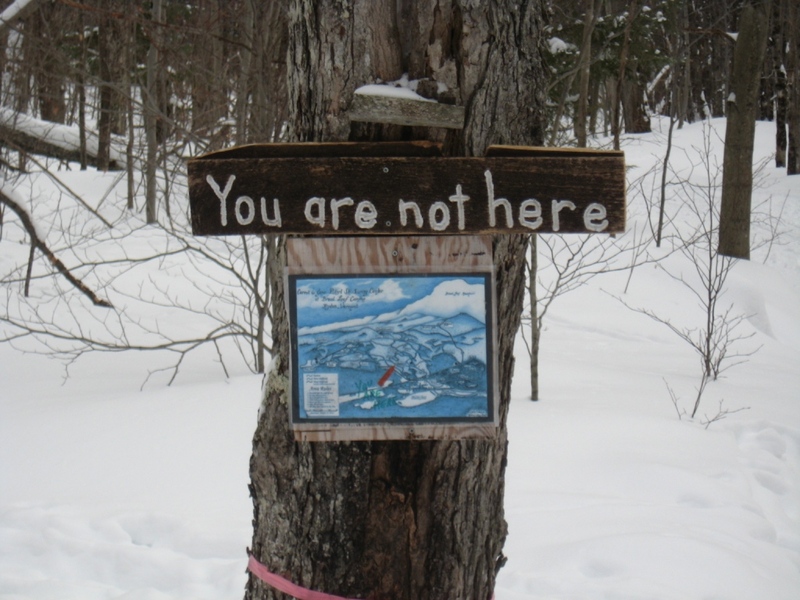 Some of my ski tours are within the confines of ski touring areas, while some are along less manicured routes. Today’s post is the former. 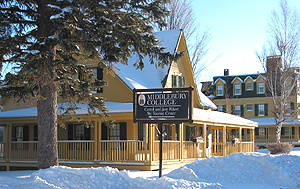 There are two fabulous ski touring areas in the mountains above Middlebury, and the Romance Mountain route is part of one of them, the Blueberry Hill Ski Touring Center in Goshen. A previous post on their summer race, the Goshen Gallop, described some of the same trails, albeit under very different conditions. 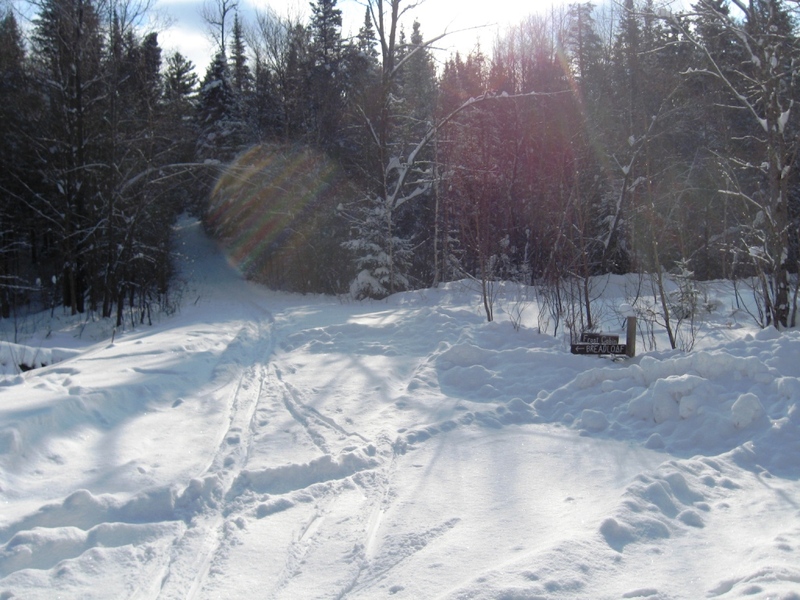 Blueberry Hill does charge a trail fee for use of the ski touring area, but it is well worth it for well maintained trails, gorgeous winter scenery, and includes homemade soup for lunch in the touring center lodge. 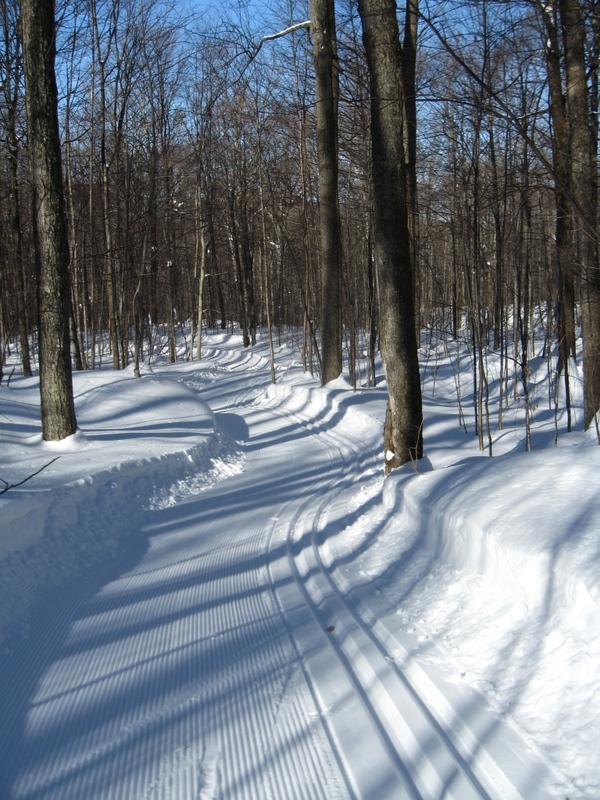 Since I knew the trails would be well groomed, I chose my skate skis for a little extra speed, but the well-set tracks would have been great for classic style skiing as well. This tour starts heading behind the Inn and follows the road to the south. After about 3/4 of a mile, follow the trail with a sharp turn back to the left, where it climbs for a few minutes, before taking the next right. After a few minutes of continued gradual climbing, this short section tops out in an open meadow with the best views of the day – the view towards the main ridge of the Green Mts. from the side of Hogback Mt. After a short descent, the trail joins a forest service road which continues to climb gradually along the south side of Romance Mt. 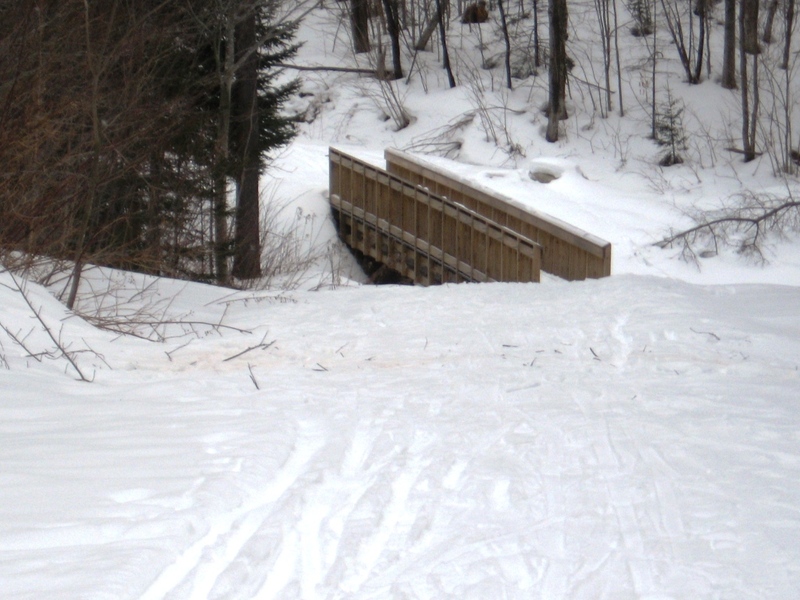 One of the trails heading off to the left has had a sign reading “Ned Gillette’s Dip” for many years, so while slurping my soup at the end of the ski, I asked the owner, Tony Clark, about the significance of the sign. Ned Gillette was one of the world’s most accomplished adventurers, a close friend of Tony’s, and a frequent skier at Blueberry Hill. Ned was senselessly killed in a robbery while trekking in the Karakoram in 1998. 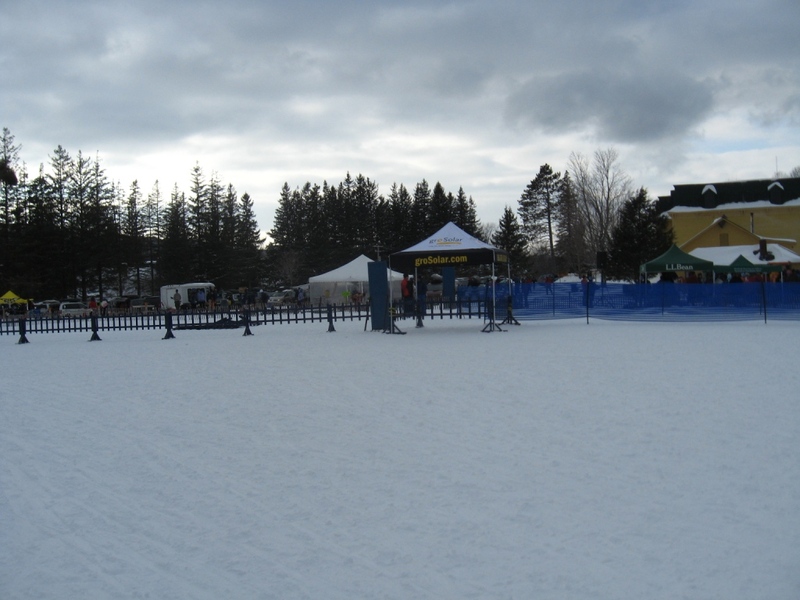 Apparently, during one running of the American Ski Marathon, a 50 Km race formerly held at the area, Ned broke both skis simultaneously at the dip in the trail with the aforementioned sign. Probably the only time I ever finished ahead of him in a race…. Shortly after this point, the forest service road dead ends, and the ski trail begins its serious ascent, marked by an ominous rusty yellow gate. 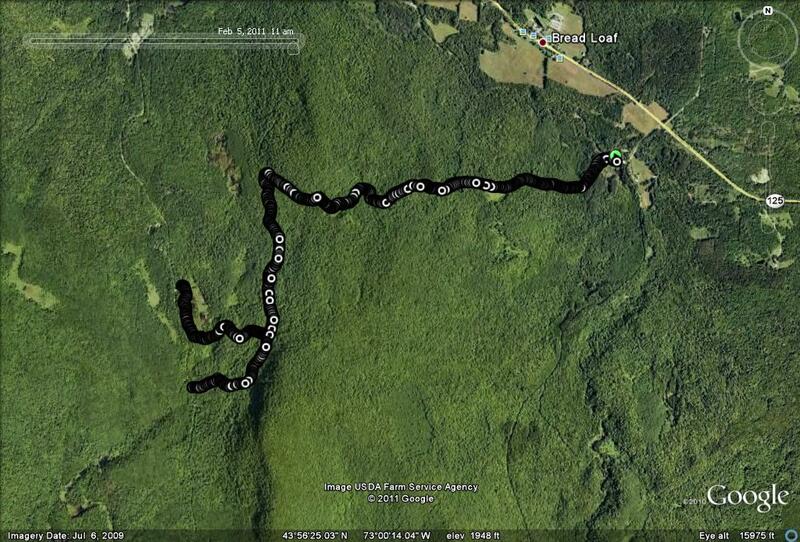 Over the course of the next mile, the trail climbs close to 1000 vertical feet. Just keep telling yourself how much fun the descent will be. The trail winds upwards through young hardwood forest (probably lumbered in the not too distant past) with so many false summits that when you reach the top, you almost expect a sign saying “just kidding”. When I finally topped out, I could tell from a few patches of yellow snow that I was not the first person to be relieved at reaching the high point! The trail reaches about 2700 ft elevation, and this could be the highest groomed cross country ski trail in Vt.
As you might guess, the descent is fast, with several sharp turns, but in good enough condition that you can push it without fear of getting upended by rough spots, other than the occasional sitzmark. Snowplowing is a horrible waste of potential energy! After about 5 min of this more technical section, the trail settles in to a more gradual descent, making for fun fast skiing. 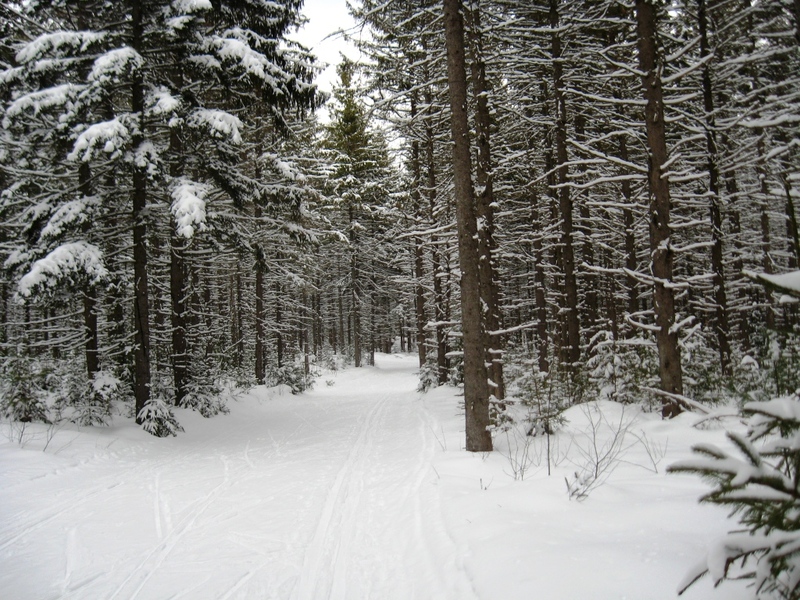 The second trail merging from the left will take you back to the ski touring center. You can tell you have missed it, if you hit another forest service road, necessitating just a few minutes of backtracking. After a short, fast final descent to the touring center, I was enjoying the day too much to call it quits, so I added on a short section below the touring center. Cross the meadow below the touring center and follow the obvious trail heading into the woods. From here on, the trail is pretty flat and fun cruising. Take the left turn onto the “Beginner Loop”, and this brings you back after a few fast miles, albeit with a few road crossings. 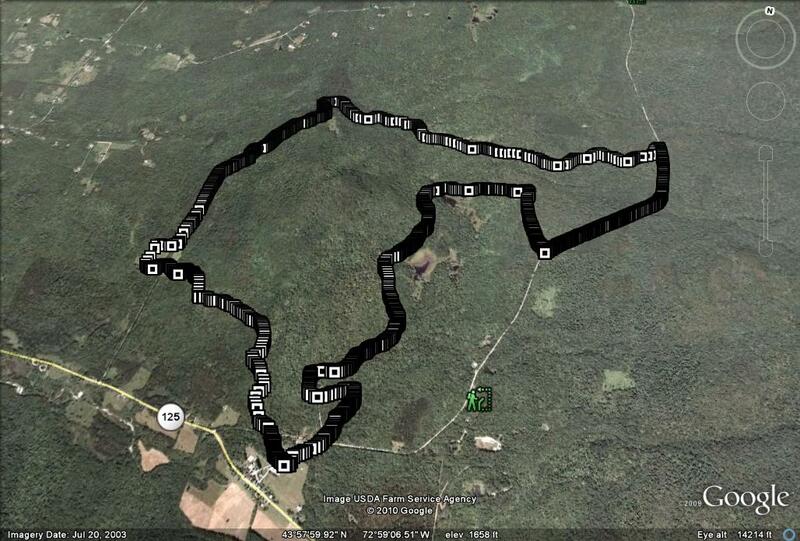 The full loop was about 11 miles, and took me about 2 hours with a few stops to catch my breath and take pictures.